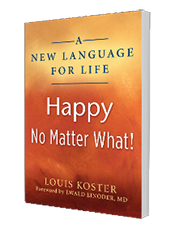 In living the possibility of a new language for life, you will have noticed a gentle shift from our default language for life towards a more wholesome and inclusive language for life. You have moved away from a language for life where “I” is who you are and gives you a past, a future and the illusion of causality. You now are adopting a language for life where “I” is no longer limiting who you are and what is possible in your life. You have released yourself from suffering and struggle. Lifting the veil of “I,” you are awakened to the oneness of being. You are awakened to the oneness of life. You have shifted from a language of “I” to a language of being. You have shifted in your consciousness and have come into a higher awareness. You feel peaceful. You feel connected and centered in life. What you aim for in life is more wholesome and meaningful. You are present to a profound sense of well-being. You feel profoundly related to people. You are present to possibility. You have come home to being. You are allowing for the diamond of being to shine brightly for both yourself as for future generations. Refer to the chart in the infographic as a quick reference guide to keep you centered and inspired in a new language for life. The chart supports you how to weather the winds and storms of life from a deep and abiding source of inner peace. The chart reminds you where you are in life and supports you in navigating your way in staying centered in a new language for life. It helps you maintain a sense wholeness, peace, and freedom to be, in the face of life’s challenges. The chart supports you in changing the dream of what is possible in your life, and support you in manifesting your life inside an awakening to your true nature. Is your book available in paperback?